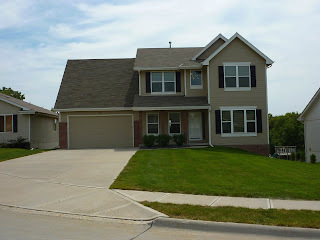 Angela May's Omaha Nebraska Real Estate Blog: New Listing! Beautiful 2 Story with Over $15,000 in Updates! New Listing - 5 Car Garage & Grand Entrance! 28 Ways to Refresh Your Bath on a Budget! New Listing! Beautiful 2 Story with Over $15,000 in Updates! Beautiful 2 Story with Over $15,000 in updates since the purchase! This Home Boasts Great Flow and Architecture, a 2 Story Entry, Rounded Corners and Cutouts, a Trey Ceiling, Hardwood and Porcelain Tile Flooring, and 6 Panel Doors. The Open Kitchen includes Stainless Steel Appliances, a Ceramic Backsplash and an Eat-In Area. The Formal Dining Room, Separate Office with French Doors, 2nd Floor Laundry and Huge 4th Bedroom upstairs are just a few of the many things this Home Features. The Finished Walkout Lower Level includes a Rec Room, a New True 5th Bedroom and a Full Bath making it Perfect for Entertaining and Hosting Guests. The Large, Private Lot is Located on Quiet Dead-End Street with Serene Country Views, a Privacy Fence, a Tuff Shed and a Brick patio that is perfect for a Firepit! For more information or to schedule a showing of this great home, please visit http://www.huskerhomefinder.com/ or contact Angela May directly at 402/709-4908.